It seems like only yesterday that I was celebrating the New Year and thinking about the different STITCHES events I am going to this year. Now, here it is almost the end of February and I leave in two days for Santa Clara to participate in/at STITCHES West! So many things to prepare before I leave but there is so little time to do it all. 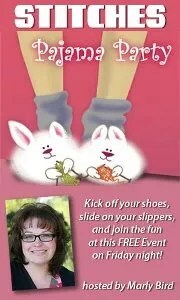 I have the demonstrations for the Bijou Basin Ranch booth and the Craftsy booth, the three classes I am teaching, and the PJ Party. Yes, I am hosting the PJ Party at STITCHES West!!! This will be the first time I have ever hosted the party and I want it to be a blast! It has kept me up at night…literally. Just last week I got up at 2am to put together my PJ Party Plan. So, now I have a fully written out plan for the party. Every minute for 2 hours and 15 minutes is scheduled with games, prizes and fun! I can’t wait. One of the things I thought might be fun is to have everybody (the people who want to anyway) to wear the same thing. I mean, something other than PJ’s. While I was thinking about it I happened to be looking at my Ravelry designer page and saw my Ratatouille pattern. I thought that it looked a little like an old night cap so I posted the pattern at 50% off for anybody who wanted to get it and make one to wear at the party. . If you are interested in getting the pattern for yourself please enjoy the discount! Code is pjparty. I don’t have any pictures to share for the party right now but my camera will be in hand so there will be a lot of pictures of the party and the Ratatouille Gang when I get back. What I do have pictures of is my a IN PROGRESS Stitch Sampler Blanket. One of my contract crocheters (and best friend) is making it so I have a sample for my classes. Must say, I am in LOVE with it!! I see in your sampler that you have a block that is using bobbles. I just finished something with bobbles and as I was making it the bobbles were on the wrong side, which I expected. I then blocked the piece and tried to pull them to the right side of my work but they are still not pushed out all of the way now that they are dry and some of them keep trying to go back to the wrong side. Do you have any tips on getting bobbles to look nice on the right side of your work?–THANKS!!! I so wished I lived in the west…. Have a great time! I look forward to hearing all about it soon.